Catfish farming is one of the profitable agribusiness venture for youths. One could easily make a lot of Money venturing into commercial Catfish farming. I will give a detailed guide on how I started my own catfish farm. Just do me a favour by patiently reading till the end. The species of catfish I'm farming. For my fish farm, I am culturing the African catfish known as Clarias gariepinus. Clarias gariepinus has an average adult length of 1–1.5 m, it reaches a maximum length of 1.7 m and can weigh up to 60 kg. My target is to achieve a live weight of at least 4kg. The System of management I used in this catfish farming is Semi-intensive system. It mainly involves fertilizing the pond so that algae will grow as supplementary feed and source of dissolved oxygen for the fishes, and occasionally flushing the pond. I am using this management option because I stay in a place where there is no constant water supply. Fertilizers are natural or synthetic substances that are used in ponds to increase the production of the natural food organisms to be eaten by the fish. These organisms include phytoplankton, zooplankton, and insects. They are all part of a complex food web converging toward fish production. By increasing the availability of major nutrients, fertilizers promote the development of planktonic algae, which provide food for many fish. Fish pond can be fertilized with two types of fertilizers. 1. Mineral or inorganic fertilizers which contain only mineral nutrients and no organic matter. They are manufactured industrially to be used in agriculture for improving crop production and they can be obtained from specialized suppliers or agro-allied companies. I used poultry droppings for the fertilization of my pond. See the video demonstration of how to fertilize pond. After fertilizing the pond I let it stand for more than one week. After one week I noticed the growth of algae which is the natural food of the fishes. I then removed the bag of poultry droppings from the pond water. When I wanted to stock my fish I removed three-quarter of the pond water which is now very green and filled up with clean water. The reason for this is to reduce turbidity and light penetration into the water. The Catfish I want to farm is the African Catfish scientifically known as Clarias gariepinus. I now introduced the fishes into the pond water. I fed the fishes three times daily; morning, afternoon and night. For the first three weeks(April 4th- April 25th) the fishes were fed 1mm of extruded(floating) fish feed rich in protein content. In the evening of April 25th, I started to feed the fishes with 1.8mm feed and that is what they are eating up till now. The video below is me feeding the fishes. 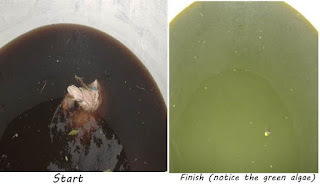 Although I use the semi-intensive culture of catfish where algae is allowed in the pond water as supplementary fish food and source of oxygen, it is important to flush the pond for a number of reasons. 1. Water changing remove excess nitrates, heavy metals (which will just concentrate if the pond water is only replaced through evaporation). So reducing like three-quarter of pond water and refilling with clean water will reduce the concentration of this compounds. 2. Flushing of pond reduces pond water turbidity which impedes light penetration into the pond water. This turbidity is usually caused by high concentration of organic matter in the pond. 3. It reduces algae boom; a condition in which the green algae becomes over-populated in pond water and harm the fishes by greatly reducing oxygen content of fish pond water. 4. It also helps reduce the foul smell that might be coming out from the fish pond. Other points to note: Always examine your fishes well and make sure they are well fed with the best feed at the fingerlings stage. Nice article. Am into fish farming. It's interesting and ok. But do you know of any local feed that can be used as substitute? Nice write-up, you're very brilliant. I Have Premium Quality Local Catfish Floating Feeds Available At N3,500 PER 15KG BAG. Pls Call:🐬 08103953855, Or 07035907330. To make a lot of profit in your Catfish farming business, you need to cut the cost of feeding your fishes and Catfish grown at high densities requires a nutritionally complete feed to produce good growth and maintain good health. I'm a local manufacturer of high quality Catfish floating Feed in Nigeria. My floating pellets are properly prepared with 58 percent crude protein good and well balance fish feed formulation. 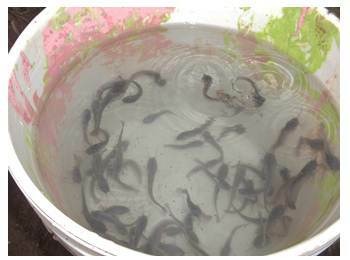 Available sizes are 0.2mm to 10mm suitable for fingerlings, juveniles, to maturity stage. We offer free delivery nationwide to your farm or doorstep." Stop buying the very expensive foreign feeds, they reap you off of your profit, the ingredients required to manufacture high quality feeds are readily available here in Nigeria hence my local Catfish feed has a high quality energy source required for growth and maintenance of body tissue resulting in improved weight gains because it is fortified with balanced vitamins, minerals and amino acids plus Stabilized Vitamin C required for better metabolism, skeletal formation, nerves, body fluid regulation and enzymes to yield maximum Productivity. WE HAVE POULTRY FEEDS, CHICKEN, TURKEY AND EGGS AVAILABLE AT AN AFFORDABLE RATE. WE OFFER NATION WIDE DELIVERY. CLICK ON MY PROFILE TO SEE SAMPLES OF MY PRODUCTS.